The Internal Revenue Service estimates the average time to complete an individual tax return will decrease by 4 to 7 percent. Converting this to dollar terms, we estimate compliance savings could range from $3.1 billion to $5.4 billion. After December 31, 2025, most of the changes to the individual income tax code revert to pre-TCJA status. If Congress allows these changes to go into effect, most households would experience tax increases beginning in 2026. In the meantime, however, individual income taxes will be substantially lower for households across the income spectrum. This paper provides a brief overview of the individual income tax and explains how the changes in the Tax Cuts and Jobs Act lead to a simpler tax code for many households. The individual income tax is the federal government’s largest source of revenue. In tax year 2015, more than 150 million individual income tax returns were filed, and in each of these filings, a household added up its income and subtracted various deductions, exemptions, and credits to report its tax liability to the Internal Revenue Service (IRS). The base of the individual income tax is adjusted gross income (AGI). To calculate AGI, an individual first adds all sources of income to reach “total income.” Next, the individual determines his or her deductions, exclusions, and credits, which narrow the tax base. Prior to enactment of the TCJA, the federal tax code included three major provisions that reduced households’ income taxes in proportion to the number of household members: the standard deduction, the child tax credit, and the personal exemption. Recall that a deduction allows taxpayers to reduce the amount of income that is subject to the tax. For example, the standard deduction means filers reduce their taxable income by a set amount. Alternatively, filers can itemize their deductions, which means they keep track of certain deductible expenses and then subtract them from their total income instead of taking the standard deduction. Exemptions likewise reduce the amount of income subject to tax. Credits, on the other hand, reduce the amount of taxes owed. The federal income tax is levied at seven rates; it is a progressive tax, in which the marginal tax rate on income increases for higher levels of income. Each tax bracket shows the tax rate an individual will pay on that particular portion of income; so, reaching higher tax brackets does not mean an individual pays that higher rate on all income, only the income within that particular tax bracket. The growing complexity of the U.S. tax code had led to large compliance costs for households and businesses. The Tax Foundation used data from the Office of Information and Regulatory Affairs and the Bureau of Labor Statistics to estimate total cost of tax compliance on the U.S. economy in 2016. Complying with the tax code creates real costs for American households and businesses, starting with just the time it takes. It took individuals 2.6 billion hours to comply with IRS tax filing requirements in 2016. This time imposes a real cost on the economy. Individuals devote resources to complying with the tax code instead of doing other productive activities. Put in dollar terms, complying with the individual income tax costs $99 billion annually. Tackling the cost of tax complexity was a significant motivation for the TCJA. The TCJA simplified the tax code by making it more advantageous for many filers to take the standard deduction, instead of itemized deductions. The TCJA expanded the standard deduction from $6,500 to $12,000 for single filers and $13,000 to $24,000 for joint filers in 2018. This near doubling of the standard deduction limited the value of itemized deductions, making it more attractive to use the standard deduction. Additionally, under the TCJA, the three provisions that reduce household income taxes based on household size were consolidated into two: the personal exemption was eliminated, replaced by the aforementioned expanded standard deduction and an expanded child tax credit. These changes, along with new limitations on certain itemized deductions, simplified the tax code for many Americans. 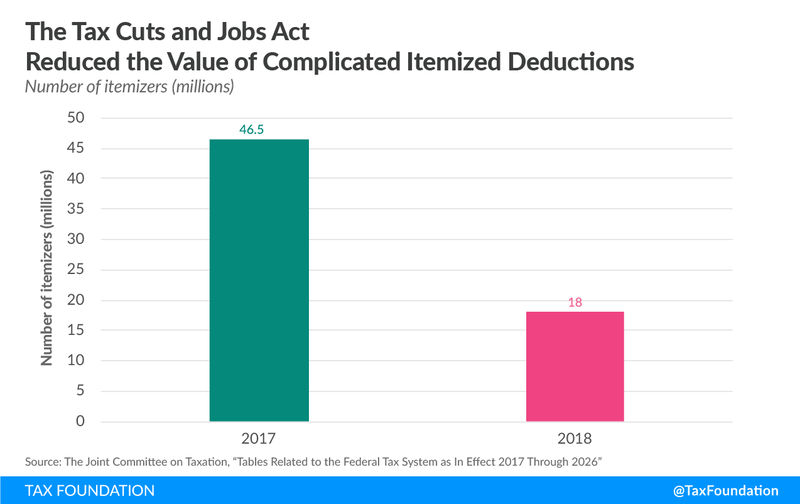 As mentioned previously, the standard deduction was nearly doubled from the TCJA, growing from $6,500 to $12,000 for individual filers, and from $13,000 to $24,000 for joint filers. By making the standard deduction larger, the value of itemized deductions is lessened. It is now more advantageous for many filers to take the standard deduction than to itemize their deductions. To illustrate why this is a simplification, consider a married couple who under previous law would have taken $14,000 in various itemized deductions. Now, under the Tax Cuts and Jobs Act, it would be more advantageous for this couple to take the standard deduction of $24,000, as it allows them to deduct an extra $10,000 and eliminates the need to spend time and energy collecting receipts and completing Schedule A of the Form 1040. In all, the Joint Committee on Taxation (JCT) estimates that the number of itemized filers will decline from 46.5 million in 2017 to just over 18 million in 2018, implying that nearly 30 million households will now find it more advantageous to take the standard deduction. In total, now 88 percent of filers will use the standard deduction to complete their taxes. In addition, these changes are concentrated among low- and middle-income groups. The number of returns itemizing deductions will fall by 75 percent for those with income between $20,000 and $30,000 and 74 percent for those with income between $30,000 and $40,000. The table calculates the percent change among returns using itemized deductions between 2017 and 2018. The individual income tax code, as mentioned above, has several major provisions that reduce household income. Many of these provisions are based on family status and can be difficult to navigate, as they may have different definitions of what qualifies as a “child” as well as other complexities. The TCJA helped alleviate some of this complexity by eliminating the personal exemption, which would have been $4,150 in 2018, and expanding the child tax credit. Recall that an exemption reduces taxable income, so its value depends on the taxpayer’s marginal tax rate. For example, if a household were in the 12 percent tax bracket, a $4,150 exemption would result in about a $500 reduction in tax liability. On the other hand, a credit directly reduces tax liability, and doesn’t directly depend on the marginal tax rate. Beginning in 2018, the child tax credit doubles from $1,000 to $2,000 per qualified child under the age of 17, with up to $1,400 refundable. The TCJA also raised the income level at which the phaseout of the credit begins, up from $110,000 to $400,000 for married filed jointly households These two provisions expand both the value of the credit as well as the number of individuals able to claim the credit. In conjunction with expanding the standard deduction, the Tax Cuts and Jobs Act limited two key itemized deductions, the mortgage interest and state and local taxes paid (SALT), and eliminated several smaller itemized deductions. The new law also makes other changes, such as those that expand the charitable contributions and medical expenses deductions. Under previous law, individuals could deduct the entire amount paid of either state individual income tax or state sales tax, but not both, along with state and local property taxes paid. This deduction disproportionally benefited high-income taxpayers. Now, itemizers are limited to deducting a total of $10,000 among state and local property, sales, and income taxes paid. The Joint Committee on Taxation estimates that this change, in concert with the new expanded standard deduction, will result in a dramatic reduction in the usage of the deduction. In 2018, an estimated 16.6 million filers will claim the capped SALT deduction, compared to 42.3 million under prior law. The cost of the SALT deduction is estimated to fall from $100.9 billion in 2017 to $36.6 billion in 2018. The TCJA also reduced the amount of home mortgage debt that itemizers can deduct interest on from $1 million to $750,000, and “suspended the deductibility of interest on home equity loans and lines of credit unless they are used to buy, build, or substantially improve the taxpayer’s home that secures the loan.” The Joint Committee on Taxation estimates that this change, in concert with the new expanded standard deduction, will result in a dramatic reduction in the usage of the deduction. In 2018, the JCT estimates 13.7 million taxpayers will claim the capped mortgage interest deduction, compared to 32.3 million in 2017. The cost of this tax expenditure is estimated to fall from $66.4 billion in 2017 to $40.7 billion in 2018. The percentage limit for charitable cash donations made by an individual was increased from 50 percent to 60 percent, meaning for individuals who donate large shares of their income to charitable organizations, they will be able to take a larger deduction. The medical and dental expenses deduction threshold decreased from 10 percent of AGI to 7.5 percent of AGI (for tax years 2017 and 2018), meaning taxpayers have a lower threshold to exceed to deduct their medical expenses if they itemize. Outside of these major changes, the TCJA also eliminated a handful of lesser utilized, Schedule A itemized deductions. These include deductions for casualty and theft losses (except for those attributed to federal disasters as declared by the President) as well as job expenses and miscellaneous deductions subject to a 2 percent floor. This too will simplify the process for filing individual income taxes, as more taxpayers can benefit from selecting the expanded standard deduction rather than itemizing various deductions. The TCJA also made reforms to the Alternative Minimum Tax (AMT), which means far fewer filers will need to spend time working on Form 6251. The Internal Revenue Service estimates AMT filings will decrease from 10 million to 1 million,  with ever fewer owing AMT liability. Running parallel to the regular tax code, the AMT is a separate set of rules under which some households must calculate their tax liability a second time. It has a larger exemption than the regular tax code, but at the same time it has fewer tax preferences; this design allows it to capture more income tax from households that would otherwise claim large deductions and have less tax liability. The TCJA increased the AMT exemption from $84,500 to $109,400 for joint filers and increased the phaseout of the exemption from $160,900 to $1 million for joint filers. This combination will result in far fewer households incurring AMT liability and for those still owing, the liability will likely be smaller. The simplification of the tax code will lead to economic savings thanks to less time spent filing. Using estimates of how many hours it takes taxpayers to comply with certain forms, we can estimate the value of time saved by certain reforms made by the TCJA. Specifically, the reduction in filers owing AMT liability and the simplified process of filing individual income taxes could greatly reduce compliance costs for certain households. In tax year 2015, 10.3 million forms were filed for the AMT, though only 4.5 million ended up owing any AMT liability. It is estimated that only about 200,000 will owe the AMT under new thresholds; however, approximately 1 million individuals may still need to file the forms to determine whether they owe. According to the Internal Revenue Service Taxpayers Advocate Service, filers who face the AMT spend almost twice as long complying with the tax code than filers who do not face the AMT. In 2017, the average total time spent filing a Form 1040 was 15 hours. Using this information, the decline in AMT filers translates to approximately 135 million hours saved, or in dollar terms, $4.6 billion. Additionally, the doubling of the standard deduction and subsequent move away from the itemized deduction will also result in tax compliance savings. The IRS has estimated that the average time to complete an individual tax return will decrease by 4 to 7 percent. This would reduce the time of 15 hours spent filing Form 1040 to an average between 13.95 and 14.4 hours per Form 1040. If we expect 150 million individual income tax filers, this translates into a total time savings anywhere from 90 million to 157.5 million hours. Converting this to dollar terms, savings could range from $3.1 billion to $5.4 billion. The Tax Cuts and Jobs Act made several significant changes to the individual income tax, which will simplify the tax filing process for millions of households. These changes include reforms to family tax provisions, such as the near doubling of the standard deduction and child tax credit combined with the elimination of the personal exemption; they also include reforms to the alternative minimum tax and lower marginal tax rates across brackets. These changes will simplify tax filing for tens of millions of taxpayers who will no longer have to itemize deductions, and instead find it more advantageous to take the expanded standard deduction. So too, millions fewer will incur alternative minimum tax liability. A simpler tax filing process translates to millions fewer hours wasted by households complying with the individual income tax, which will translate into real cost savings. For a discussion on the costs and benefits of making the individual income tax changes permanent, see Nicole Kaeding, Kyle Pomerleau, and Alex Muresianu, “Making the Tax Cuts and Jobs Act Individual Income Tax Provisions Permanent,” Tax Foundation, July 10, 2018, https://taxfoundation.org/making-the-tax-cuts-and-jobs-act-individual-income-tax-provisions-permanent/. If extended, these provisions would increase long-run GDP by 2.2 percent, long-run wages by 0.9 percent, and add 1.5 million full-time equivalent jobs. In the long run these provisions would reduce federal revenue by $165 billion annually on a conventional basis and $112 billion dynamically. Erica York, “Sources of Personal Income 2015 Update,” Tax Foundation, Feb 27, 2018, https://taxfoundation.org/sources-of-personal-income-2015/#_ftn1. Scott A. Hodge, “The Compliance Costs of IRS Regulations,” Tax Foundation, June 15, 2016, https://taxfoundation.org/compliance-costs-irs-regulations/. Speaker Ryan Press Office, “The Tax Cuts and Jobs Act,” Nov. 7, 2017, https://www.speaker.gov/press-release/tax-cuts-and-jobs-act. The value of the standard deduction is inflation-adjusted, so these values increase annually. The Tax Cuts and Jobs Act also lowered marginal income tax rates across brackets, leading to increases in after-tax incomes for all taxpayers, on average. For a discussion of the distributional impact of the TCJA, see Huaqun Li and Kyle Pomerleau, “The Distributional Impact of the Tax Cuts and Jobs Act over the Next Decade,” Tax Foundation, June 28, 2018, https://taxfoundation.org/the-distributional-impact-of-the-tax-cuts-and-jobs-act-over-the-next-decade/. Scott Greenberg, “Five Ideas for Simplifying the Individual Tax Code,” Tax Foundation, July 24, 2017, https://taxfoundation.org/five-ways-federal-tax-code-simpler/. Internal Revenue Service, “In 2018, Some Tax Benefits Increase Slightly Due to Inflation Adjustments, Others Unchanged,” Oct. 19, 2017, https://www.irs.gov/newsroom/in-2018-some-tax-benefits-increase-slightly-due-to-inflation-adjustments-others-unchanged. For discussion of a new deduction for pass-through entities created by the TCJA, see Scott Greenberg and Nicole Kaeding, “Reforming the Pass-Through Deduction,” Tax Foundation, June 21, 2018, https://taxfoundation.org/reforming-pass-through-deduction-199a/. Jared Walczak, “The State and Local Tax Deduction: A Primer,” Tax Foundation, March 15, 2017, https://taxfoundation.org/state-and-local-tax-deduction-primer/. The Joint Committee on Taxation, “Tables Related to the Federal Tax System as in Effect 2017 through 2026,”, 8. The Joint Committee on Taxation, “Estimates Of Federal Tax Expenditures For Fiscal Years 2017 – 2021,” May 25, 2018, 44, https://www.jct.gov/publications.html?func=startdown&id=5095. Internal Revenue Service, “Interest on Home Equity Loans Often Still Deductible Under New Law,” Feb. 21,2018, https://www.irs.gov/newsroom/interest-on-home-equity-loans-often-still-deductible-under-new-law. The Joint Committee on Taxation, “Tables Related to the Federal Tax System as in Effect 2017 through 2026,” 7. The Joint Committee on Taxation, “Estimates Of Federal Tax Expenditures For Fiscal Years 2017 – 2021,” 37. Kelly Phillips Erb, “What Your Itemized Deductions On Schedule A Will Look Like After Tax Reform,” Forbes, Dec. 20, 2017, https://www.forbes.com/sites/kellyphillipserb/2017/12/20/what-your-itemized-deductions-on-schedule-a-will-look-like-after-tax-reform/#6f5739dc6334. Internal Revenue Service, “Proposed Collection; Comment Request for Regulation Project 83 FR 34698,” July 20, 2018, https://www.federalregister.gov/documents/2018/07/20/2018-15627/proposed-collection-comment-request-for-regulation-project. Laura Saunders, “Who Will and Won’t Pay the AMT, America’s Rich-Person Tax?” The Wall Street Journal, May 18, 2018, https://www.wsj.com/articles/who-will-and-wont-pay-americas-rich-person-tax-1526635802. 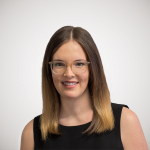 Erica York, “Under Conference Agreement, Fewer Households Would Face the Alternative Minimum Tax,” Tax Foundation, Dec. 16, 2017, https://taxfoundation.org/conference-report-alternative-minimum-tax/. Taxpayers Advocate Service, “Repeal the Alternative Minimum Tax, 2013 Annual Report to Congress,” 298, http://www.taxpayeradvocate.irs.gov/2013-Annual-Report/downloads/Repeal-the-Alternative-Minimum-Tax.pdf. Internal Revenue Service, “1040 Instructions 2017,” 100, https://www.irs.gov/pub/irs-pdf/i1040gi.pdf. These hourly aggregates were translated into compliance costs by multiplying them by average total employer compensation costs for private industry workers of $34.17. See Bureau of Labor Statistics, “Employer Costs for Employee Compensation – March 2018,” June 8, 2018, https://www.bls.gov/news.release/pdf/ecec.pdf. “Internal Revenue Service, “1040 Instructions 2017,” 100.